Bowling can be a Saturday night treat, especially after a stressful week. You get to compete against different people or just bowl at your pleasure. First, you buy a lane, locate a ball, and rent a pair of those standard shoes that are usually offered. However, if you’re more serious about the sport, you may want to have the best bowling shoes to help you improve your game. Special shoes help to protect you from injuries and also help to prevent damage to the floor’s surface. Additionally, their high level of flexibility can keep you on the right path when making your throw. Most shoes for bowling typically have non-marking or leather soles to allow you to move across the floor more easily while keeping you flexible, balanced, and well supported before releasing the ball. Like most sports gear, shoes come in different styles, models, and brands to suit persons of different skill levels. It’s usually difficult to find the perfect pair, but I’ve listed the best on the market to help you get your game on! Bowling becomes so easy with the Dexter Jack shoes. The comfort of these shoes is second to none. This is quite important since you spend a lot of time on your feet during bowling, where footing is also necessary. The Dexter Jack shoes sport a microfiber sole to prevent sliding while bowling. They feature the traditional lace-up design and soft and durable man-made upper for extreme comfort. The lace-to-toe upper pattern also offers a custom fit. The non-marking rubber outsole helps to keep you flexible and sturdy all game long. Besides, non-marking means that the shoes won’t leave any marks on the floor’s surface even when your movements become a bit more intense. If you’re not one for bright colors, these shoes will be your perfect pair. They come in black and white with a two white streaks running slantingly from the toe area to the collar. Verdict: The Dexter Jack Shoes is perfect for long hours of bowling and have great features to maximize your game performance. If you’re ready to take your bowling performance to the next level, the Brunswick Men’s Flyer is the way to go! The Brunswick Men’s Flyer is ideal for players who bowl at a fast rate. It provides good feet support, especially on shiny surfaces. These shoes are super comfortable, allowing your scores to climb each time you bowl. No longer will you be restricted to those regular shoes that are available for rental. Instead, the Men’s Flyer offers something simpler, more durable, and way more comfortable. Imagine that you can remain stable and flexible in your game while your opponents look on from behind. The non-marking rubber outsole gives you a good grip and doesn’t mark the floor’s surface. The Brunswick’s Comfort-Fit construction makes the shoe sturdier and more durable. In addition, the soft, durable man-made upper cushions your feet for a whole different bowling experience. These shoes come with the lace-up design for a secure fit. They also have a microfiber slide pad on both feet with the FlexSlide Technology. This feature helps you slide when throwing the ball. Verdict: Bowling is never the same with the Brunswick Flyer Shoes. With so many fantastic features, you can rest assured that your comfort, flexibility, and stability will be at the highest levels. Take over the game in style, comfort, and great flexibility in a pair of the classic Dexter Men’s Ricky III shoes. Purchasing the Ricky III will be one of the best decisions you’ll ever make. They look like regular street shoes, almost like the skateboarding style. The Ricky III is all about appearance and comfort. It has a great stitch and sturdy materials that boost its composition. The color options range from black and red to white and black, giving you that extra style to blaze the alley. These shoes are stylish, true to size, and offer the same comfort you would get from your regular tennis shoes or sneakers. The stitching is clean and the felt pads on the bottom will give you the slide you need. If your feet are crippled up with bunions or arthritis, it’d be difficult to find a good pair of shoes for bowling. However, the Ricky III is perfect and will work wonders for you at your next bowling event. The Ricky III also comes with the lace-up design to keep your feet in place, giving you more stability and comfort. Verdict: The Dexter Men’s Ricky III shoes are perfect for those who like to bowl in style, comfort, and with great flexibility. These shoes will help you reach your desired goals, leaving you happy after a night of competitive bowling. Whether you’re an amateur or professional bowler, you have not yet reached your full potential until you’ve tried the BSI Men’s 571. Tired of paying for shoe rentals? These attractive and well-made shoes will keep you on top of your game when it matters most. The Men’s 571 is extremely comfortable. It is not stiff, so not much break in will be required. The slide and traction on these shoes are great. Imagine that you can remain comfortable and stable while you throw the ball because of the shoes’ lightweight rubber outsole. The action leather upper also provides added comfort for a better bowling experience. The Men’s 571 comes in a mixture black and gold, with gold stitching running throughout most of the upper. The lace-up design helps to keep your feet secure with the padded tongue providing that added comfort that you need. Verdict: The BSI Men’s 571 shoe is ideal for bowlers of any caliber. It’s amazing craftsmanship and affordable price makes it the perfect option for your bowling needs. These fashionable and modern shoes from Brunswick are a great choice if you want a bowling faceoff this Saturday night. The Men’s Warrior has a nice outside appearance, appearing almost like normal tennis shoes. The insides are well-cushioned, giving your feet the much-needed comfort and relaxation. The uppers are made from nice-looking, strong leather and help to keep your feet comfortable. Additionally, the lace-up closure gives you a secure fit and prevents the shoes from falling off your feet. Imagine that you can choose from a variety of colors such as royal blue and orange. There are also color mixtures like black and royal blue and black and orange. The Comfort-Fit construction features a padded collar and a logo patch on the mesh tongue. This feature provides the much-needed comfort for a long period of bowling. Though the Men’s Warrior is lightweight and it provides good support. You’ll love the nice-looking orange color. It’s not overpowering but has a nice accent. Verdict: Whether you’re a left or right hander, the Brunswick Men’s Warrior shoes will make you the master of bowling – no doubt! Its features are effective in providing you with the right amount of comfort and flexibility to help you enjoy your game, no matter the time of day. Ladies, why settle for normal shoes when you could treat yourself to the BSI Women’s #651? Food for thought! These pink and black shoes look stylish. In fact, it’s one of the most stylish women’s shoes you’ll ever see. They feature sport leather uppers for all-game comfort and a padded tongue and collar for added cushioning. Imagine that you can move with great flexibility due to the BSI’s sturdy rubber outsole. That would be great, wouldn’t it? The stitched and glued slide sole allows for quick and stable movement when throwing the ball. All bowling pins down! Hooray! The lace-up system keeps your feet secured, especially when approaching the alley to throw the ball. These women’s shoes only come in pink and black. Honestly, the colors are beautifully aligned, making the shoes pleasing to the eyes. Your shoes will be the main topic of discussion among those in attendance! The lightweight EVA midsole has an embossed pink “BSI” logo on the outer sides, highlighting the brand name and adding to the stylishness of the shoes. Verdict: When it comes down to bowling in style, the BSI Women’s shoes is a great option. Its mixture of pink and black colors makes it unique and attractive. Besides, you can enjoy bowling in comfort and with superior flexibility. Are you a female bowler who loves to bowl in style and comfort? If you are, you’ll like the Dexter Women’s Raquel IV. The Raquel IV looks like regular tennis shoes, so they’re not obnoxiously ugly. Besides, they are really comfortable. In fact, they are much nicer and more comfortable than the shoes offered for rent. These shoes come with non-marking rubber outsoles with defined horseshoe heels. This way, you won’t damage the floor’s surface or leave behind any marks. If you’re worried about size, then no need to. The lace-to-toe upper pattern offers a custom fit. Furthermore, the soft, durable man-made upper keeps your feet feeling comfortable and relaxed. The thing that I love about these shoes is their color arrangements. These shoes come in a mixture of white and blue and white and pink. These are cool colors that give you a nice stylish look, but not too much. Verdict: The Dexter Women’s Raquel IV is an awesome shoe for women. Its many features collaborate to provide you with extreme comfort and flexibility for a great game of bowling. Additionally, the white and pink and white and blue colors look awesome! Throw on a pair of Brunswick Women’s Spark and bring home the bowling title this weekend. The Women’s Spark possesses a decent amount of slide on the pad and offers a comfortable fit. The lime and purple color options make the shoes more attractive, especially when you have the suit to match. The lace-up closure does an excellent job at keeping your feet secure and well-fitted. This means you can enjoy your game without the annoyance of your shoes falling off. Imagine that your feet can remain comfortable all game long because of the soft, durable man-made upper. Sounds great, doesn’t it? Indeed! The microfiber slide pad on both feet with Flex Slide Technology is a cool feature. It actually helps to give you that slide to throw the ball correctly – all bowling pins down. If stability is a great concern for you, you can rest assured that you’ll be right on your feet for the entire game. The strong rubber outsole gives you that balance you need to perform at your best. Verdict: Bowling won’t be the same after trying out the Brunswick Women’s Spark. These shoes offer great amounts of flexibility and comfort and allow you to enjoy your game at full performance. Experience bowling at the highest performance by putting on a pair of 3G Women’s Kicks. These shoes offer a great traditional style for the ladies. They can also be used by women who are either left handed or right handed. The synthetic leather construction provides a comfortable fit and helps you perform better for longer, even under pressure. The shoes also provide a bit of slide with its synthetic leather construction. Even if you’re not a professional bowler, these shoes will prove to be the best option for you. They’re cute and look much better than those gross rentals at the bowling alley. Besides, you’ll get your money’s worth in just a few wears. The Women’s Kick features the traditional lace-up design which helps to secure your feet. Moreover, the shoes come in a pink and white color that is perfect for most – if not all – females. Verdict: The 3G Women’s Kicks shoes are excellent for the casual female bowler who wants to improve her bowling performance. The Brunswick Women’s Curve is ideal for bowlers of any style. These shoes feel great and look sharp on the alley. Just make sure that you prepare for the many compliments you’ll get. Imagine that you can get added comfort from the welt construction with EVA midsole. The Comfort-Fit construction also provides you with extreme comfort on the alley for better bowling performance. The non-marking rubber outsole with raised heel offers superior stability and doesn’t leave any marks behind. Not to mention the microfiber slide on both feet with FlexSlide technology that paves the way for that much-needed sliding movement. These women’s shoes sport the traditional lace-up system for a more secure fit. The shoes come in white with a streak of purple to match the ball or your outfit. Imagine that your feet can remain comfortable due to the soft, durable man-made upper. Comfort is important in bowling, so that would be a great thing to have! Verdict: The Women’s Brunswick Curve is an incredible shoe for any style of bowlers. With its many features, it can help you unlock new levels in any bowling event – whether competitive or casual. Bowling can be very interesting, especially on a Saturday night. Different families turn out to compete or just bowl casually. Either way, the fun never ends! Whether you’re a beginner or a professional bowler, having the right footwear is essential for helping you perform at your best. The most comfortable shoes for bowling aim to protect you from injuries and help you to prevent damage to the floor’s surface. 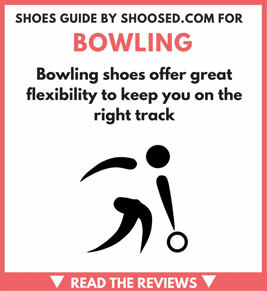 Additionally, shoes for bowling offer great flexibility to keep you on the right track when approaching the alley to make your throw. With so many different brands and styles of shoes, it becomes difficult to pick out your perfect pair. However, my top recommendations for the best shoes for bowling from the list is the Brunswick Men's Flyer for men and the Dexter Women’s Raquel IV for the ladies. Experience extreme bowling performance at your next weekend night out by wearing the best footwear that you can get. Happy bowling!